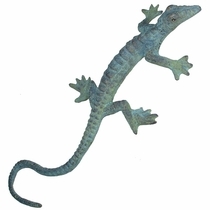 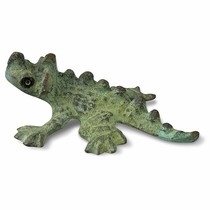 This selection of rustic bronze lizards, frogs, turtles and sunfaces are all hand forged bronze from Mexico. 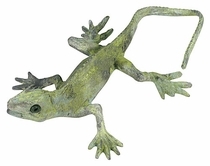 The patina finish gives a weathered rustic look to any southwest or Spanish Colonial decor. 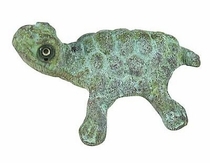 These patina bronze animals and sunface accents make great gifts or the perfect accent addition to any room. 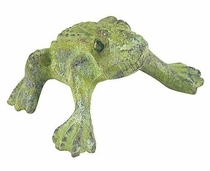 Expect some variations in color, finish and size on all of our rustic bronze accents. 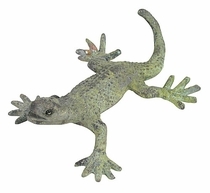 Color can vary from a light green patina to a dark green/brown patina and almost black. 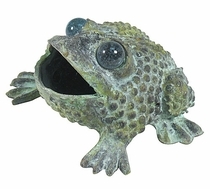 We receive a wide assortment of pieces from our artisans in Mexico and can never be sure what we'll have in stock. 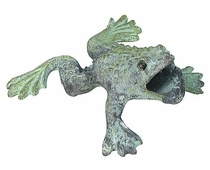 More rustic bronze accents available: Bronze Nail Heads & Rosettes, Bronze Door Knockers, Bronze Door Pulls and Handles. 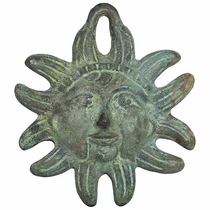 Bronze Patina Mexican Sunface Wall Decoration 4" Dia. 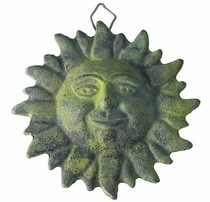 Cast Bronze Mexican Sun Wall Decoration 4" Dia.